Child safety fencing paired with supervision can save the lives of hundreds of children a year. You may think that standard fencing is enough to protect your child from harm, but that is not always the case. According to the U.S.Consumer Product Safety Commission, an estimated 260 children under the age of five years drown each year in residential swimming pools and spas. Additionally, 3000 children under the age of five years are treated in hospital emergency rooms as a result of submersion accidents each year. 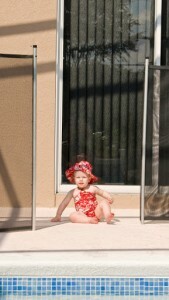 Child safety fencing provides security, prevents accidents and in turn – saves the lives of young children. Have you considered implementing a child safety fence around your pool or property? Child safety fencing does not only increase the safety of children, but is a great option if you are looking to increase pet safety. First, consider if your pool fence is being implemented primarily for decoration, privacy or security. While decorative fencing can be more aesthetically pleasing, you should consider functionality in your design above all else. The vertical pickets of your fence should be more than 4 inches apart, while the barrier should be no shorter than 4-feet-tall. These measurements prevent children from being able to squeeze through the fence or climb over it to gain entry to the other side. If there are any horizontal framing members, they should be on the interior of the fence, facing the pool. This will prevent children from stepping onto them to assist in climbing over the fence. Remember, child safety fencing is not a substitute for adult supervision. You have more than one popular option when choosing the material of your pool fencing – including wood, metal, aluminum and vinyl. Wood fences are typically made of cedar or pressure-treated pine. Cedar is durable and has a natural resistance to insects and moisture. Aluminum, steel and and vinyl pool fences (especially vinyl and aluminum) are known to be even more durable and long-lasting than wood. They also require little to no maintenance. Are You Ready to Talk to Someone About Child Safety Fencing? Mid-Atlantic Deck and Fence offers many different styles of standard and child safety fencing as well as custom design built fences to choose from. We are also one of Maryland’s only manufacturer and installers of vinyl fencing. If you have any questions about Decking in Baltimore, please contact Mid Atlantic Deck & Fence (MAD Fence) today by clicking here or calling 1-800-833-9310. You can also follow us on Facebook and Twitter.